The Memphis Bar Association's Young Lawyers' Division honored Shelby County Circuit Court Judge Gina C. Higgins with the 2018 Chancellor Charles A. Rond Memorial Award for Outstanding Judge of the Year at its annual meeting on November 8, 2018. In 1976, the YLD established an award to be given annually to an outstanding Judge in Shelby County in honor of the late Chancellor. Chancellor Rond was known for his intelligence, fairness, wise decisions, integrity and great wit. In casting their vote, YLD members were asked to consider the ability, demeanor, integrity and diligence of each nominated judge. 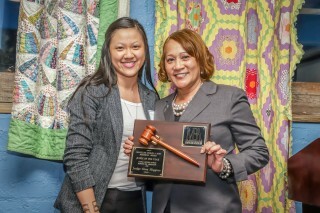 YLD President Mary Wu Tullis presented the award to Judge Higgins. Judge Higgins was first elected to the 30th Judicial District Circuit Court in 2010. She won re-election in 2014.